Grab this black trapper hat for ONLY $1 with Amazon.com Prime and a code from the gleam at bottom of blog post. WIND PROOF - 100% Premium insulating polyester outer shell combined with a luxurious inner faux fur layer. FULL COVERAGE - Covers face, ears, nose, mouth, and even eyebrows. DURABILITY - Perfect head gear for outdoor activities such as skiing, snowboarding, hiking, hunting, and trapping. ADJUSTABILITY - Removable face mask and adjustable chin strap. UNISEX FITMENT - One size ?ts most, ideal for 22 inches to 24 inches head circumference. Mysuntown Unisex Winter Trooper Hat Black Hunting Hat Ushanka Ear Flap Chin Strap and Windproof Mask. Old school style meets tenacious warmth in this Russian-style unisex Winter Trooper hat or Mysuntown hunting hat. Flock lining provides warmth and comfort. Polyester outer shell makes cleaning the hat easy. Chin straps and buttons fasten ear flaps. Removable face mask protects against the wind in extreme outdoor weather or during snow sports like skiing and snowboarding. The removable face mask will keep your face protected from biting winds whether you work outdoors or enjoy winter sports. 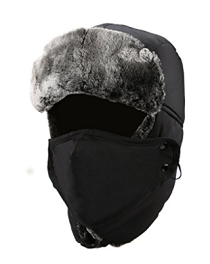 The windproof mask attaches to the hat with two snap buttons on either side. and the Mysuntown Winter trooper helps to do just that. The classic unisex Mysuntown Winter Trooper Hat doubles as a Russian-style leisure hat when the weather is less cold. Tie back the ear flaps when not required for a different look and in warmer weather. They can be tied back by pulling the adjustable chin straps over the head. The attractive dark faux fur lends a classic look that can be worn up or down. The hat is suitable for men and women, and with all kinds of winter wear. Whether you are hunting in the woods,playing outdoors or heading out into town on a winter's evening, this hunting hat will provide you with the warmth that you need. The hat translates very well into modern outfits. Wear it with a coat or poncho, jeans and boots, and you can look great. Affordable Quality and Comfort, Choose Mysuntown, Choose the Best Trooper Hat.